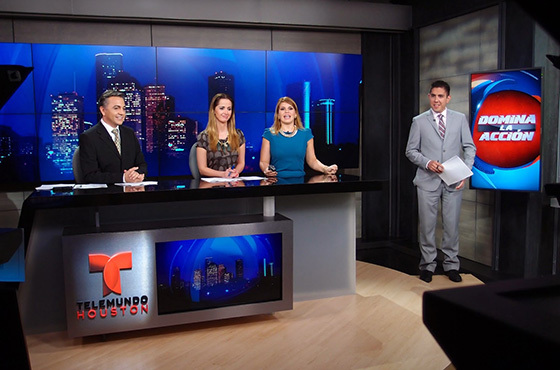 For KTMD-TV Telemundo in Houston, TX the challenge was to take a brand new space with video walls, LCD displays and Chroma-key elements and design a daylight balanced, fully functioning studio that was easy to maintain without causing delay in the studio’s packed programming schedule. In order to create a cost effective and attractive space that would keep light from spilling in from the large bay window overlooking the active newsroom below, Barbizon Lighting, Lighting Designer Bruce Aleksander and KTMD-TV Telemundo, created a plan to implement daylight balanced fixtures that would not only minimize the light from newsroom window, but also hide the glow that the LCD and video walls emitted at various points throughout the studio. Utilizing Robert Juliat TIBO Led ellipsoidals and Desisti Magis and Leonardo fresnel units, created an efficient and quality space. Desisti fluorescent fixtures were employed as soft key lighting and for the Chroma-key wash.
To control all of these fixtures, the ETC Element console and Doug Fleenor opto-splitters provided a balance between allowing for future growth and providing appropriate control for the current situation.